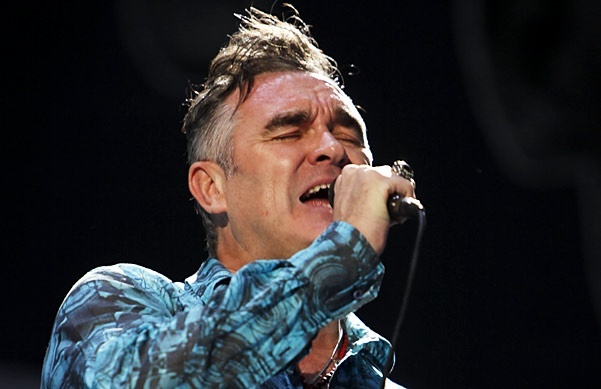 The story’s already made it around the world: Morrissey apparently was so nauseated by the smell of barbecued meat during his performance last night at the Coachella Valley Music and Arts Festival that he felt ill during his set. So could that explain why he canceled tonight’s show at the Paramount Theatre in Oakland, Calif. — what would have been the final night of his illness-plagued U.S. tour? Or could it be a recurrence of the health problems that forced Moz to cancel five of the first seven dates of the trek in late February and early March? As with the earlier cancellations, nobody’s saying much. The venue’s site says the show is canceled “due to illness,” but there’s no update on Morrissey’s own Web site. Needless to say, fans aren’t pleased, particularly those who made efforts to travel to the singer’s only non-Coachella date in California on the current tour. One even suggested, on the Morrissey-solo.com fan site, that the cancellation wasn’t due to illness, but, rather, anemic ticket sales. This, coupled with the earlier cancellations, is simply unprofessional. I will never again travel to see Morrissey or rely upon his tour schedule in making arrangements for travel, hotels, or such things.